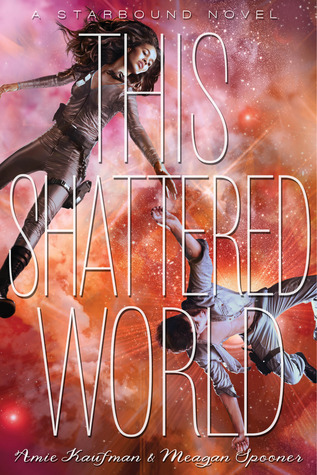 In These Broken Stars, Lilac LaRoux and Tarver Merendsen escape the terrifying wreck of the space liner, Icarus, and uncover a mysterious race of "beings" being persecuted by Lilac's mogul father. The story continues on a new planet with new pieces moving toward a very dramatic end. Avon is a planet plagued by war. Flynn Cormac is looking for a peaceful way to end the bloodshed and save his planet and people from destruction. Avon hasn't progressed through the terraforming process as quickly as it should, and Flynn wants to know why. Jubilee Chase is the military hero that everyone fears. She's a soldier, obeying commands and doing what is necessary to keep her men alive. When the "whispers"that saved Lilac's life appear on Avon, the two enemies discover that, in the end, they're fighting for the same thing. I always have a bit of a problem when a series changes voices with each book. I had gotten to know Lilac and Tarver, adore Lilac and Tarver, and trust Lilac and Tarver. But all of the sudden I'm dropped onto Avon, knowing no one, and wondering how in the world everything is going to come together. Jubilee and Flynn grew on me though, Flynn in particular. He's a good man. Despite a horrible lot in life, he maintains hope. Jubilee was a little more difficult to get to know. She was guarded and complicated. In the end, she made a decision using her heart and not her instincts which was noble. The love story seemed a little too convenient and easy in this series sequel just as it had in its predecessor, but the conflict and tension is definitely heightened. The stakes are building and a tipping point felt near at the end of the book. There is little to no development for secondary characters, but interesting facts are revealed about both Jubilee and Flynn through the interludes between chapters. The "whispers" are real, present, and observant. And they're mad. Still very little to do with space, but I've come to like this terraforming thing.